HIGH: Everything You Want to Know About Drugs, Alcohol, and Addiction — Nic Sheff, David Sheff (2019) From the son & father behind “Beautiful Boy”, this is intended for a teen audience but it’s a great tool to use as a conversation starter for parents, educators, counselors, and teens. DOPESICK: Dealers, Doctors, and the Drug Company that Addicted America — Beth Macy (2018) With a ground level focus on how the epidemic hit her own community, longtime journalist Beth Macy tells the story through the eyes of those fighting the disease of substance use disorder, their families, first responders, and the community ravaged by this epidemic. AMERICAN FIX: Inside The Opioid Addiction Crisis – And How To End It — Ryan Hampton (2018) From the perspective of a recovery advocate, this is not just another guide to what’s needed to solve the crisis. Hampton explores the growing social movement focused on the millions of Americans in recovery from substance use disorder plus their families, friends, and other stakeholders – and what’s needed to support long-term recovery in our communities. 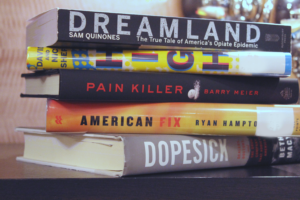 DREAMLAND: The True Tale of America’s Opiate Epidemic — Sam Quinones (2015) Quinones investigates and tells the story about the perfect storm that lead up to the opioid epidemic: Purdue Pharma’s release of Oxycontin and how we got where we are today. PAINKILLER: An Empire of Deceit and the Origin of America’s Opioid Epidemic — Barry Meier (Updated 2018) In 2003, Meier wrote a groundbreaking report on the Purdue marketing campaign that promoted OxyContin, the drug that many believe was the gateway to our national epidemic. Select one that resonates with your community. Alternatively, you can provide several options and have the community vote. Your local library generally purchases new releases of popular books, especially best sellers. For a community book read, you may need to work with them in advance for extra print copies. Include digital copies as well if your library works with Kindle or Nook. How many of you think our community is facing a serious crisis? How many of you think it’s not very serious or not in your neighborhood? How many believe opioid use is a personal decision or failure? Who or what do you think is to blame for this epidemic? What surprised you in this book? Did this affect your perception about how the opioid crisis started? In what way? Much of the stigma that faces people with substance use disorder is that it’s their personal choice, and demonstrates a moral failing. Research and science show it’s a disease – just like diabetes or heart disease. After reading this book, how does this affect your belief about people who use substances including opioids? For the personal stories that were shared in the book, did it change your opinion of those with opioid use disorder? Why or why not? Were there any parts of the book that were particularly thought provoking or disturbing? Where do you see gaps in our own community in how we are responding to opioids? The author outlined some possible solutions or changes that need to happen. Which ones do you feel could address the issue you see in our community? Have other books on this issue that you’d like to recommend? Let us know at community@safeproject.us, and be sure to tell us if you have a community discussion!